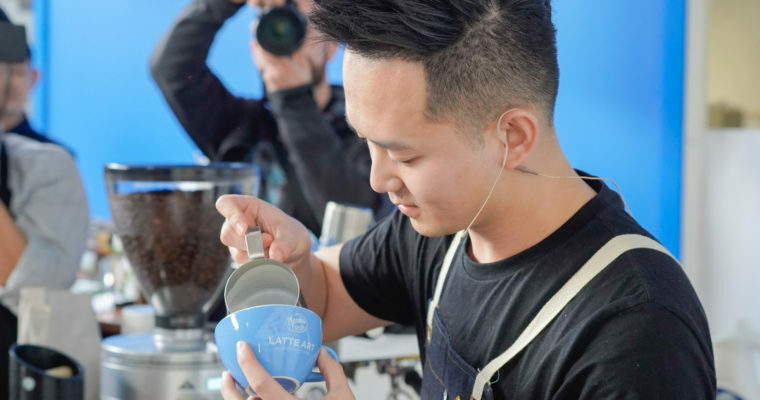 We interview Leo Li, two-time running Meadow Fresh New Zealand Latte Art 2018 Champion. I am currently working as the main barista at Atomic Coffee Roasters. On a typical workday, I normally start my day around 6.30am. Every day my goal is to make great coffee with latte art for our customers, sometimes in takeaways. That’s basically what I do every day, make coffee. The best part of my job is really to get feedback from my customers that they have enjoyed my coffee very much and I have made friends through coffee. Outside of coffee, my other main interests would be going on road trips, knowing different cars, listening to music and movies. Also, I like to watch other latte artist’s latte art videos around the world on Instagram, which I quite enjoy doing. On my days off, I make sure I have a good rest first to recover from the working week and just have a slow day to enjoy myself. What did you want to be when you were growing up and what inspired you to get into coffee? To be honest, I haven’t thought about what I would do when I was a kid until I grew up and got to make coffee and found myself really enjoying it! Then I decided that’s what I wanted to do as my career. I can remember my very first coffee-related experience was my first job as Esquires. When I saw my colleague doing latte art, his beautiful coffee influenced me to want to try and do it myself. That was back in early 2012 and I have been working with coffee and latte art since then. What advice do you have for some starting their career in coffee? For someone who’s starting their career in coffee, the vital thing is interest. They will have higher opportunities to succeed if they have passion and love for coffee and latte art and really put their heart into it. I guess that it is the same as any other career if people want to do well in. What’s in store for you and the coffee industry in the future? I am really hoping to have my own coffee shop in five years’ time and start my own latte art classes to help those ones who are new to the industry or wanting to enhance their latte art skills. In my opinion, the coffee industry may develop into more diversified areas in the future as people have different needs in terms of quality and variety of coffee. With more and more advanced technology in coffee machinery, it will affect the whole industry and I can see there will be a continuous improvement in the taste of coffee in the future. My dream coffee experience would be winning the World Latte Art Championship, that’s the short-term dream. Also, it would be a dream to have my own coffee shop and my own team to serve you guys amazing coffee. Leading up towards the WLAC, what are you doing training wise? Training, I will be doing my normal routine practice. I’m still deciding on patterns for the WLAC. The most exciting thing would be the competition, meeting with all the talented competitors from all over the world and enjoying the competition. Afterwards, I would like to taste their local coffee. There are many people I would like to thank again. Atomic Coffee Roasters, my trainer and all my friends who had supported and helped me prepare for this year’s competitions. Thank you again and I will do my best at the WLAC. We wish Leo and Team New Zealand all the best in Belo Horizonte this November.